This is the sixth year we've been treated to the Movie Maniacs line. Clearly one of the best ideas Todd ever pursued, I think the people that first suggested it were brilliant. This year, Mcfarlane decided to do a couple odd things with the line. Usually the line is released in the fall, close to Halloween. Last year, this was delayed until November due to the dock workers lock out/union issues in California. This year, rather than wait til the fall, they've moved the release way up to the spring. The second departure from the norm was the character selection. In past years, the set was made up of a variety of figures from different films. They usually represented movie characters that people loved and wanted as action figures, but on their own couldn't support an entire series of figures, like the Crow or Michael Myers. These films have one or two great characters at most, so the odds of ever being produced in a full action figure line were low. But by putting together a line that was intended specifically for these lone wolves, the originators of the idea came up with the perfect way to get these figures to market. 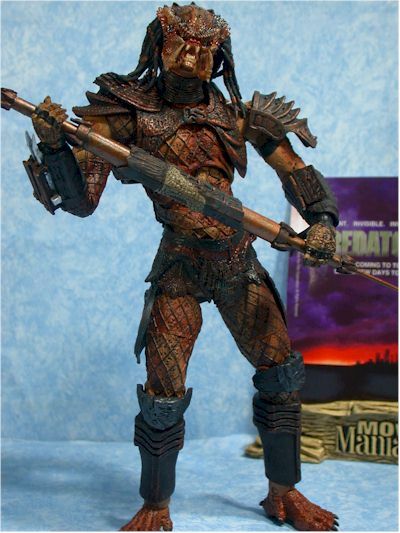 This year, they've taken the Movie Maniacs away from this purpose for the first time, producing a full series of six figures PLUS the deluxe version around a single theme - the Predator/Alien movies. While it's true that Predator and Alien are two separate franchises, in most people's minds these films are tied together. 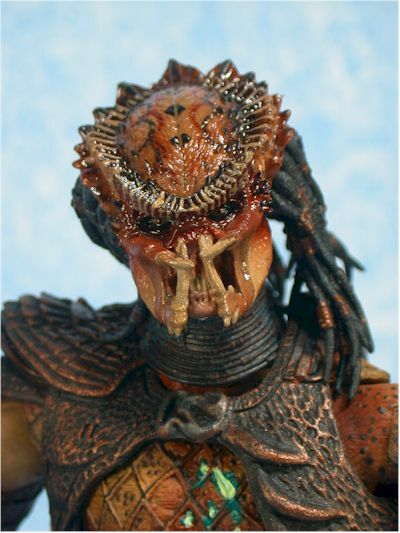 The desire for a Predator vs. Alien film, and the comics about the same topic by Dark Horse, makes this more of a single theme than two separate franchises for the purposes of this series. Is that a mistake on Todd's part? Only time can tell. It won't hurt the MM6 sales - he's picked a perfect pair of films for this themed wave, that have a tremendous amount of fan support. But if we only get single themed sets under the Movie Maniacs banners in coming years, we'll have lost what made this line great - the chance to get those single characters that we otherwise never would have seen. 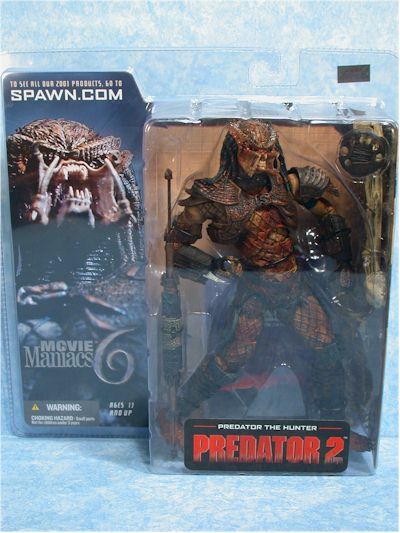 There are two Predators in the assortment, both based on the movie Predator 2. One is simply called the Predator, and that's how I'll refer to him in the review, and the other is Predator the Hunter. I'll be calling him Hunter in a feeble attempt to slow my tunnel carpal down. There are also two Aliens - a Warrior Alien and a Dog Alien. Look for a review of the Warrior Alien next week at Movie Poop Shoot. These are showing up at Gamestops and Meijers stores right now, and I have some on-line options for you at the end of the review. Expect to pay at least ten bucks, and up to thirteen depending on the retailer. The clamshells work great. They hold up to shelf wear, they are smaller than most card backs, they pack away easily for the MOCers, and the graphics on the insert card are excellent. If I had one complaint, it's that there isn't enough text on the insert - there's little or no discussion about the particular figure itself or it's accessories. 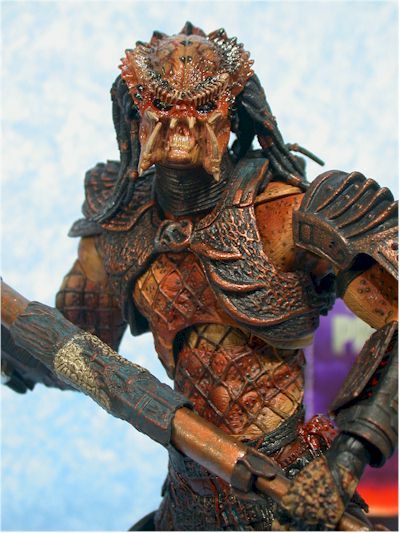 The sculpts on both Predator's is excellent. 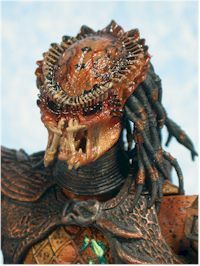 The Hunter comes with an open mouth expression, while the regular Predator has the closed mouth to accommodate the mask that can be placed over his face. Both are extremely well done, and while most folks are likely to choose the version with the mask (to complement the previous version in the two pack that did not have a mask), I wouldn't overlook the Hunter. Both body sculpts are identical. There is only one 'new' figure here, and the other is a 'redeco'. Which is which is up to you. But although the torso and legs are the same, the sculpt is still extremely well done, with tons of details and beautiful work. The right arms are different on each figure. 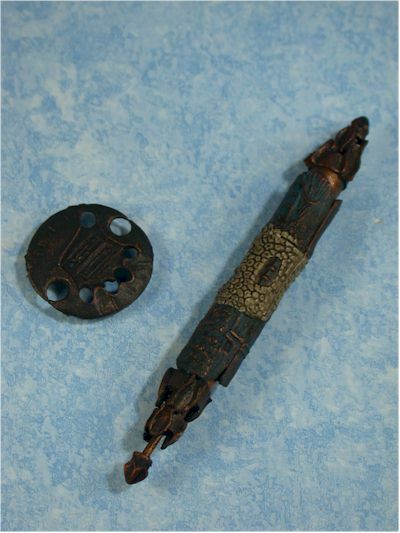 The Hunter can open his 'control panel' on his forearm, but I was disappointed with the cheesy hinge and poor quality. Be very careful, because it's very easy to break this, and it does not work well. This is particularly disappointing, since the two pack Predator had a much better one. Comparing the two, you can see how much weaker the quality is in this one area. I took off a half star on the Hunter for this very reason. 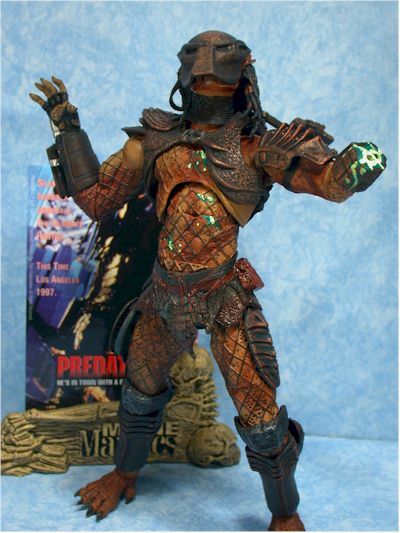 The Predator has a removable left arm, hacked off by his opponent. The sculpting is very good, but you might have to dig out some of the paint in the holes used to attach the arm to get it to fit. Once you do, you'll find that it snaps together tightly, and looks fine either attached or loose. The hand sculpts are also different for each character. They are designed to hold the weapons that comes with each, and look terrific. The paint ops on both these figures is much better than the two pack version. While there's still some shininess to the head, the darker colors don't make it so obvious and annoying. The body is darker as well, and overall the coloration simply looks better. All the detail is there as you'd expect, and the stumpy Predatory also has a neon yellow/green paint splashed across his arm and body, representing his own blood. To add to the detail, the paint is even glow in the dark. On my figure there was just enough too, and I was glad they didn't go overboard with it. There is only one negative with the paint applications. On both figures, the left lower shoulder is devoid of any sculpting or paint details, and is just plain brown. While most of it is covered by a section of body armor, it is not entirely covered, and is pretty obvious when you view the figure from that side. I can't complain about the articulation, although I know some people think it's TOO much this time. At first I thought I was going to agree, particularly with the waist/chest articulation. From the pictures I saw, I thought he looked too skinny through the torso, but now that I have him open, and have played around with him a bit, I don't think it's an issue at all. He looks far better in person than he does in photos. There's every point you could want in these figures - ball jointed neck (with a decent range of motion), those funky ball jointed shoulders that Todd has been using that actually involve three joints in the torso, the ball, and the arm, cut elbows, wrists, and waist, ball jointed chest and hips, cut thighs, and great knee and ankle joints. On top of all that, the blades hidden in his right forearm can extend and retract, and the knee pads move up and down to allow the legs a greater range of motion. None of the articulation hurts the sculpt (even the ball jointed chest), and I found I could pose him in all kinds of cool ways. I particularly like the ball jointed neck and chest, which give you many options in scrunching forward or leaning way back. 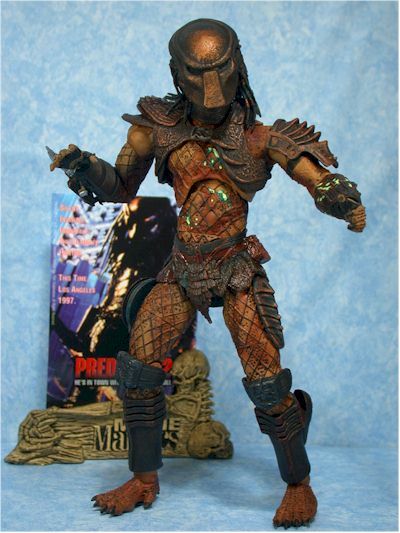 But the big improvement here over the two pack Predator is the inclusion of the leg articulation. With the first version, I have to use the stand to get him to stay posed in a decent way. Sure, he stands without it, but I have to lean him back and twist the legs in such a way that he doesn't look quite so imposing any more. With these two, I had no trouble finding lots of good poses using the leg articulation, and there's absolutely no need for a foot stand. By the way, both of mine came with a foot peg hole in the left heel, but I've heard that some of them don't. If there was one thing I'd change, it would be the shoulder pad on the left shoulder. They did not hinge it the way they did the knee pads, and it ends up restricting the arm quite a bit. I broke mine off on the regular Predator about five minutes out of the package, and while it's easy to glue back on, having it move would have been a big improvement. There's not a lot here, but what is here is very nice. The Hunter comes with two accessories - his discus, and his spear/staff. The disc is nicely sculpted, and fits in one hand easily. It also snaps into place on his belt, a great touch that could have easily been overlooked. Too often we don't give companies credit for going the extra mile, and this is one of those cases where had they not done this, it's unlikely anyone would have complained. Yet they did it anyway, because they wanted the figure to be the best possible. The staff collapses down and extends out on all three sections on either side. I couldn't get the Hunter to hold it in too many ways - the inner section is too large to fit in his hand, while the very outer sections are too small - but there are one or two decent poses he can take with it. 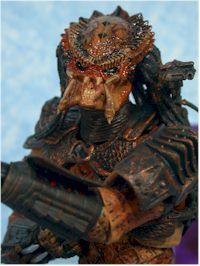 The Predator comes with the same discus, and his mask. While the mask is actually attached to the figure (which is his biggest negative) I consider it an accessory since the Hunter doesn't have one. The mask looks fantastic, and snaps in place fairly well. It is attached to his back, as it was in the film, with some rubber hoses (presumably for breathing). While this is movie accurate, it makes taking the mask off and displaying him without it difficult. The hoses also get in the way in taking it on and off, and are easy to break. This is one of those situations where they went to far with the accuracy, and having the mask simply not attached to the body would have been wiser. Actually, both figures come with a third accessory - the movie poster. I think it's about time they drop this though if this is what we will be getting. The stands are small and identical, and the posters have gotten so thin they almost droop (and probably will over time). Drop the stands and shave a buck of the price. I don't always include this category, but this time I felt it was necessary. While everything is here to have a perfect figure, there were two quality issues that really bothered me. - the poor quality of the control panel on the Hunter's arm. It is far inferior to the one we got with the two pack version,	and really hurts the final score for the figure. - the rubbery, cheap plastic used only in some places. The laser weapon on his backpack is the best example. This weapon	should lift up and out, and rotate around. While it's designed to do that, the plastic is so rubbery that it has a tough time staying	up or even together. I paid ten bucks for these, and if you manage to pick them up at that price you can add another half star. They are extremely well sculpted, with great paint ops, decent accessories and excellent articulation - ten bucks is not too much to ask. However, I suspect most folks will end up paying closer to $12 or $13, and that's too much green, even for these. 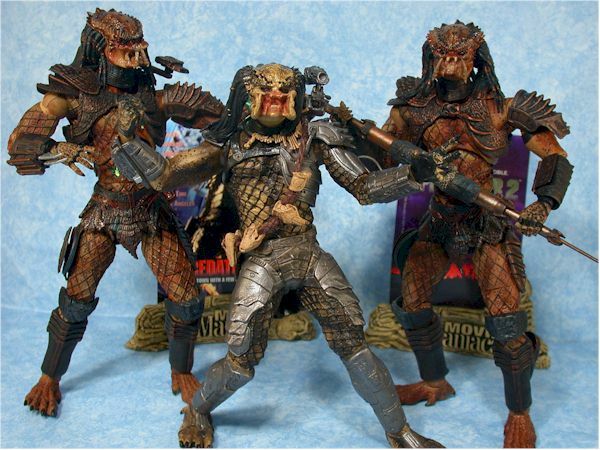 These are damn nice figures, and if you're a big Predator fan you shouldn't pass them up. I'm thrilled to see Mcfarlane finding ways to add useful articulation to his figures without seriously compromising the excellent sculpts. If the quality of the plastic, especially that on the laser weapon, and the detail on the control panel had been a bit better, these would have been four star figures. - Beans Toys should have them any day, and is selling the set of four for $40 plus shipping. - Aisle Sniper should also have them soon, and is selling a set of four for $40 plus shipping.